JYSK, one of the world’s leading furniture and home decor retailers, plans to double the number of its stores in Bulgaria over the next four years, confirmed Alexandru Bratu, Country Manager, JYSK Bulgaria and Romania. What’s Next for JYSK in Bosnia and Herzegovina? 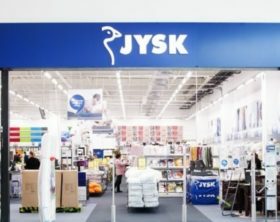 JYSK, has recently opened its 24th store in Bosnia and Herzegovina, announcing plans to continue its expansion on the Bosnian market in 2019. JYSK, one of the world’s leading furniture and home decor retailers, opened its 70th store in Romania on the 7th of February. The new unit is located on no. 17 Bucium Road in Iasi. JYSK, one of the world’s leading furniture and home decor retailers, is expanding its presence in Romania with new store openings. JYSK, one of the world’s leading furniture and home decor retailers, continues its expansion in Romania with two new store openings in the cities Slobozia and Mioveni, taking place on the 17th of January. JYSK, one of the world’s leading furniture and home decor retailers, opened its new store on no.bb Tuški Road in Podgorica, Montenegro, on the 1st of November. JYSK, one of the world’s leading furniture and home decor retailers, opened its new 3.0 store concept within the retail park Aviv Park Zrenjanin on the 4th of October.